New Delhi: The TB Free India Summit 2019 organized by Member of Parliament and Global Champion on TB, Mr Anurag Thakur, witnessed widespread support from political leaders, health experts, media and NGOs. The two-day event organized to endorse the vision of Prime Minister Narendra Modi for making India TB Free by 2025; five years ahead of the global target witnessed political heavyweights from across party lines, Bollywood actors, MPs, MLAs, national and international health experts, media editors come together to advocate for a Tuberculosis free India. Day one of the summit and cricket tournament saw keynotes and endorsement from Speaker Lok Sabha, Sumitra Mahajan, Chief Minister of Haryana Manohar Lal Khattar, Minister of State Parliamentary Affairs Vijay Goel, Sanjay Singh, Member of Parliament, Manoj Tiwari Member of Parliament, Siddhant Mohapatra, Member of Parliament and Bollywood Actor Sohail Khan and Vatsal Seth. 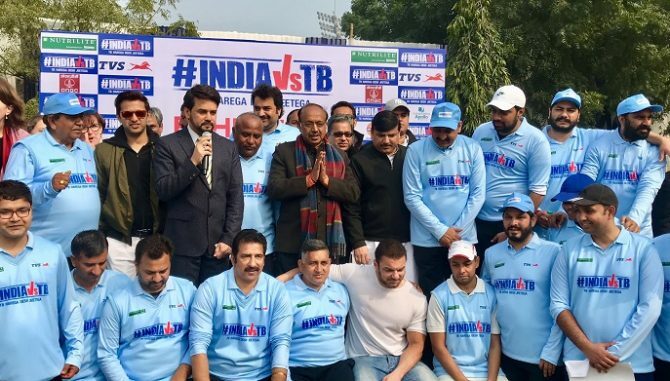 The TB Free India Summit 2019, ‘Member of Parliament’s XI & Chief Minister’s XI TB Cricket Tournament is being held in New Delhi on 2nd and 3rd February 2019 at the Major Dhyan Chand National Stadium. The first day of summit saw a cricket match between Haryana XI and Punjab XI (Ministers, Members of State Legislature and MPs), which was won by Punjab XI led by Vijay Inder Singla, Minister, PWD and IT, Punjab. This initiative is supported by The Global Fund and The International Union Against Tuberculosis and Lung Disease (The Union). The day two of the summit too garnered support from Health Ministry with Union Health Minister Mr J P Nadda being present himself at the summit, paving the way to supplement Prime Minister’s vision of making India TB Free by 2025, five years ahead of the global target. The teams of Delhi XI and Uttarakhand XI comprising Ministers, Member of Parliaments, Member of Legislative Assembly, Bureaucrats, played a friendly exhibition match, showcasing their support towards India vs TB. An inaugural address by Mr J P Nadda set the tone for the summit and cricket match, which was followed by keynote addresses from a host of Ministers such as Health Minister Delhi Mr Satyendra Kumar Jain, Finance Minister Uttarakhand, Mr Prakash Pant. The closing remark was addressed by Minister of State for Civil Aviation, Mr Jayant Sinha, bringing the two-day summit & cricket tournament towards a successful culmination.